How do my tables look? and some other ametuer tuner probs - Miata Turbo Forum - Boost cars, acquire cats. This tune tends to do fairly well...does everything look right? Ive played with almost every option possible in TS but i cant ever get the idle just right. also my wideband is an AEM (was installed in car already) dont know what type (just a gauge no controller). Ive been using the project property: "Tech Edge WB 0-5v 19:1" and no kidding the readings on the TS gauge are pretty much dead on with the physical gauge. AEM property reads .5 afr off at least. Still get a rich condition the first 5-10 minutes of driving even when the CLT temps are 160 and up. The car just wants to run rich and will idle way high for a while even after being warmed up until its been driven a good ways. Check out my tables and see if there is anything that looks off? You are running a lot more timing advance at idle than I am. See if dropping those cells to 15-18 and then adjusting your other idle parameters to find a happy place makes it stable. I think it will help. Also curious why tune for 16afr at 6k rpm low kpa? Also why so lean at wot? And why is the timing lower 5-6k mid kpa, then goes high again? Never seen anything so weird. So for the AFR's in low kpa and high rpm where should i be aiming? closer to 15.0's? I will fix the drop in advance like you pointed out. also I changed the spark advance at idle rpms and it helped a little.. oscillation occurs still at like 10 sec intervals, but the are less sporadic. One thing i don't believe i mentioned is that my req-fuel is at 11.6 and my idle screw on manifold is not even touching the spring flange on the TB. should i try to lower my warm idle duty to 8 and give it some idle screw and possibly some more req-fuel? what idle rpm should i try achive? ive seen some people say that 800rpm is good and 1000rpm is good..
wot - 13.5 from 1k to 4k, 13 after 4k rpm. To be honest probably would be much better to interpolate a lot of those. 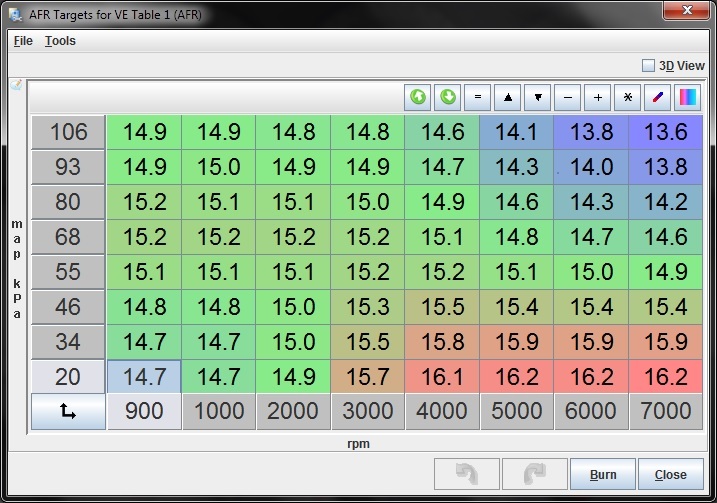 Keep in mind the AFR target table is the guide for the VE table, and the VE table is what the ecu runs. 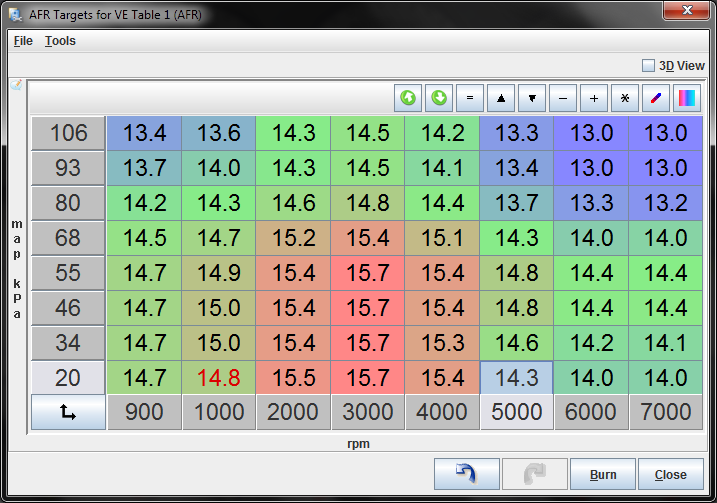 That said it may take some time before autotune makes changes to the VE table. Last edited by zacktrotter_uncc; 02-16-2014 at 02:06 PM. 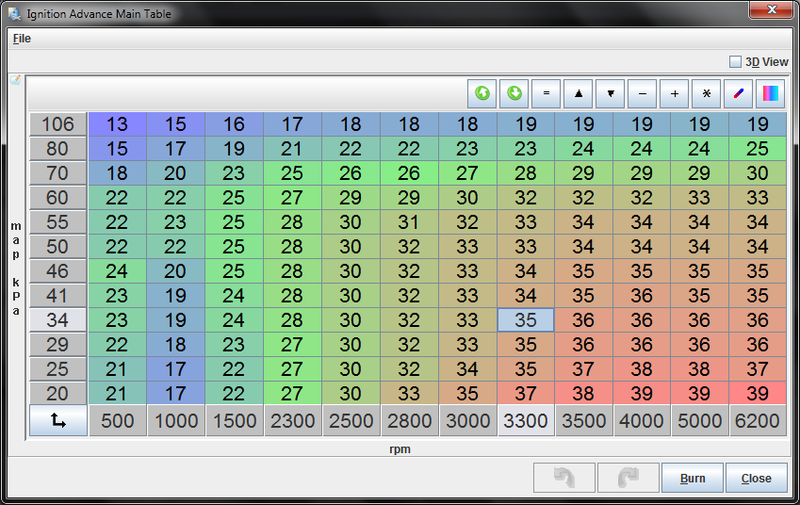 Timing table, 500 and 1k.. from 0 to 60kpa make it 16 degrees, 15 for the above 3 (6) cells. For the afr table 2k to 4k at 80kpa and above add .2-.3 afr. 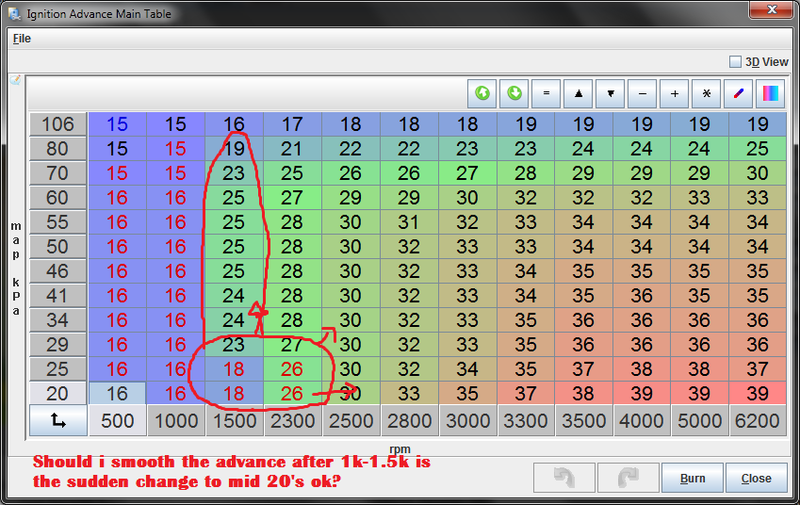 Your idle oscillates because it's changing timing between 22-18. That's too much as well. Put the idle cells down to 15 range like sixshooter said. 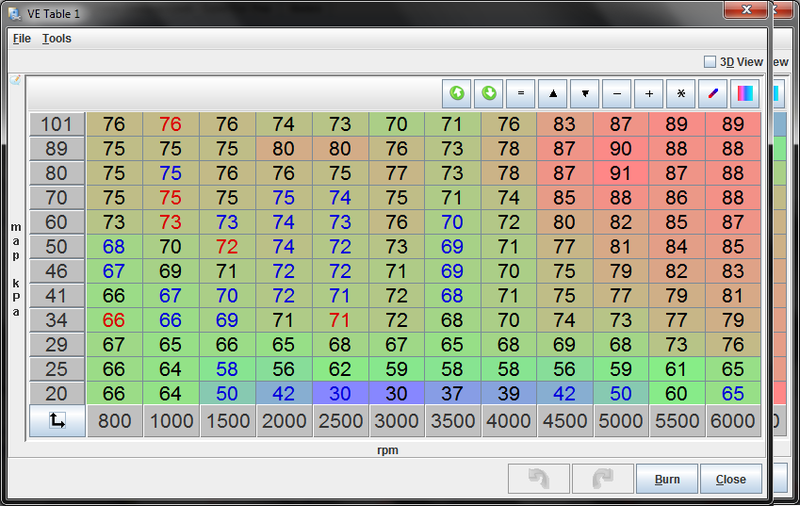 It will be loads smoother and idle AFR should be 14-14.5 after you have it tuned right. As pointed out in my graphic, What about the sudden change in the spark tables from 16-18 to mid 20's ? - should i smooth? or interpolate? smoothing raises the new 16's to 18 but gets better transition. Yeah, that should be a smoother transition sir. Its fine. You do not want to change the 1k cell higher as then it would screw up ur idle. If you want to drop the 1.5k down 1 to 2 degrees to smooth it out then have at it but then you'll probably lose efficiency. What ms is this btw? why such a low cell count? I knew nothing about tuning and after market ecu's and programming before hand but now i am kind of forced to learn. tried out the changes today, ran ve analyze for a 15 min run. my idle dropped down to 600 rpm idle and was twitching back and forth like crazy. 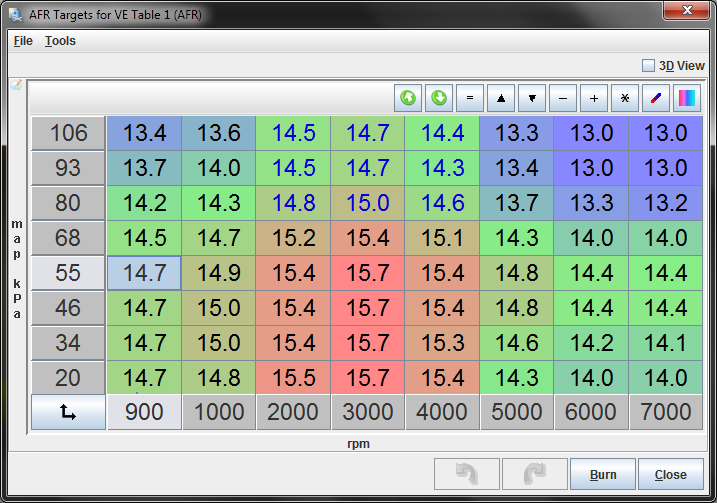 turned up warm idle duty cycle to 10, and smoothed out ve tables at idle. 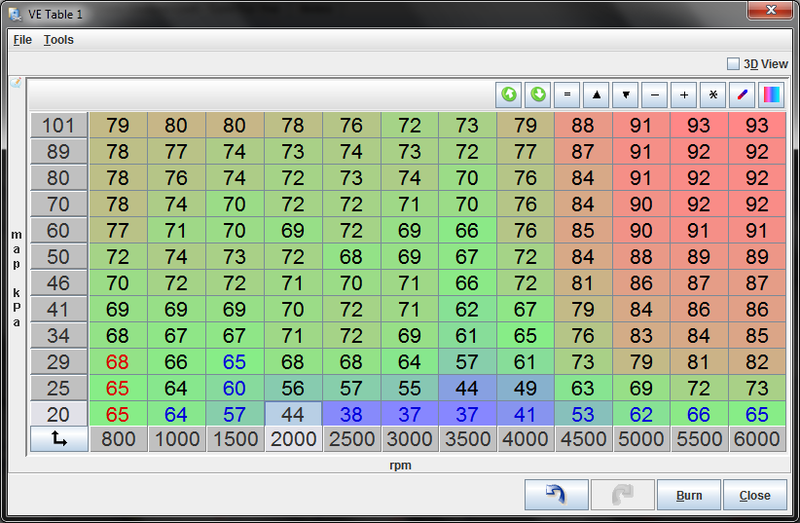 it helped the oscillation a lot but really its just about the same as it was before. but nonetheless everything AFTER 1500 rpm is running great! starting to wonder if something mechanical is screwed up that could cause the disruption in the idle. added 4 degrees to the first 3 500 rpm cells? What are u running now 20 degrees at 500 rpm? "drop the first x axis down 3-400 rpm lower than the target idle, and raise them 4-6 degrees higher, making a valley"
this is "supposed to have a stabilizing affect on idle"
You shouldn't need to run that much timing at idle. 12-14 usually gets the job done. What that writeup is talking about is adding a row, not adding timing. 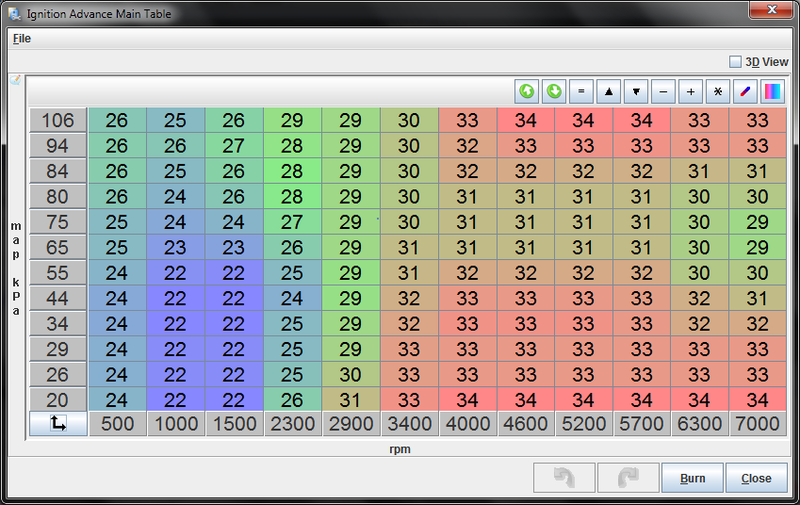 You typically want a row that's a bit lower than your target idle, one at idle, and one slightly higher. then when it searches you use all 3 rows to "stabilize"